Incredible that something so simple can be so tasty, but it is. This is at it’s best made with new season beans. The crunchiest sweetest ones. When you find these then this is the time to whip this up. OK, you don’t need to mention that it contains lots of cheese. It may not be an every night side dish but there should be enough occasions that you could find to make it. Something else that you may like is you can add all kinds of other vegetables to it. You can add vegetables such as broccoli or Brussels sprouts or grilled zucchini. If you don’t want to use green vegetables then you could substitute baby carrots or roasted cauliflower or mushrooms. The other thing that makes this irresistible is the crunchy pumpkin seeds. Prepare the Green Beans. Top and tail the beans. Steam and cool or blanch in hot water. Take off the heat. Add the grated cheese and stir till melted. The liquid should be hot enough so that the cheese will melt when the cream cheese is stirred. Add a little fresh grated pepper . Taste and add salt if necessary.Put the sauce aside aside keep warm. Put a small frypan on the heat and once hot add 1 Tablespoon of oil add the pumpkin seeds and toss over heat until starting to colour. sprinkle with a little salt and pour out onto a plate or dish to cool. 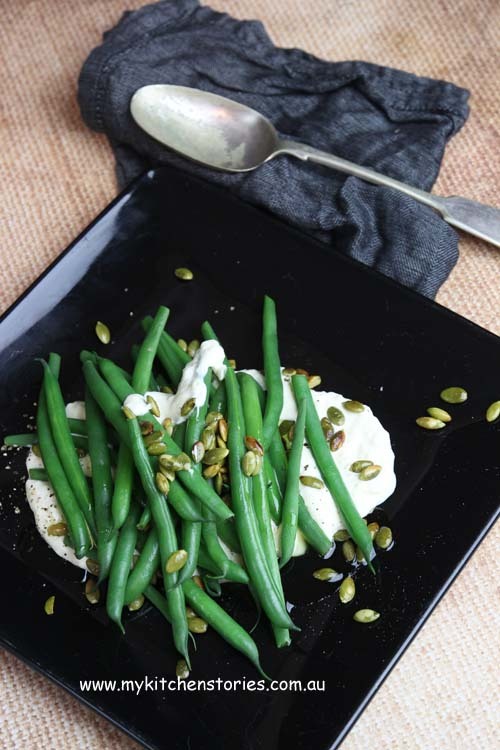 Spread some of the Parmesan cream onto a dish or platter. 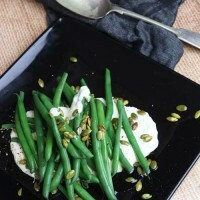 Put the warm beans on top and sprinkle with pumpkin seeds and a drizzle of olive oil. I love these beans! I did vote for you. I hope you win because I love your blog. Hehe nothing wrong with a lot of cheese! 😀 The more cheese the better really! 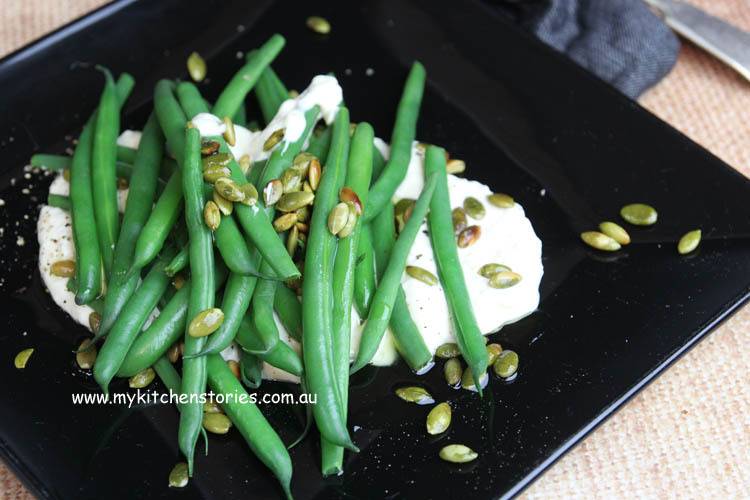 What a nice way to dress up beans Tania, much snazzier than my usual chopped parsley sprinkle! A scrumptious dish and wonderful combination! This looks so fresh and incredibly delicious! Congrats on your win!! Your green beans look terrific…I cannot wait to get some fresh summer produce! 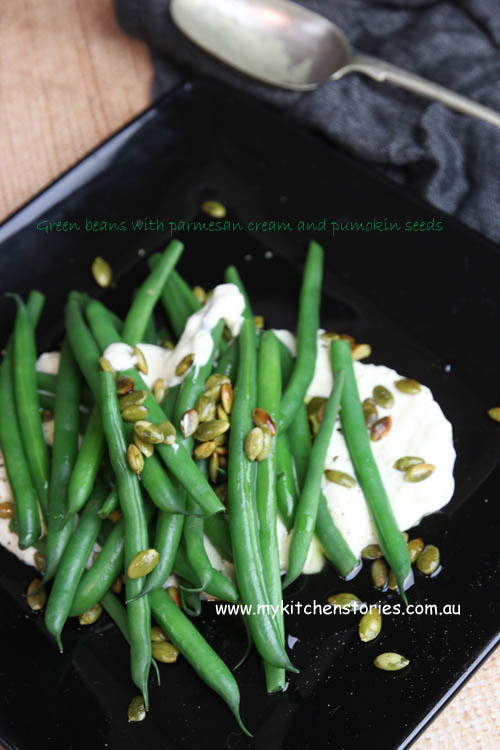 Sometimes simple ingredients really are the best – I love the use of pumpkin seeds here! I love green beans but never have I had them prepared like this. The parmesan cream sauce sounds fantastic! I voted for you and hope you get good news once the polls close. Good luck!